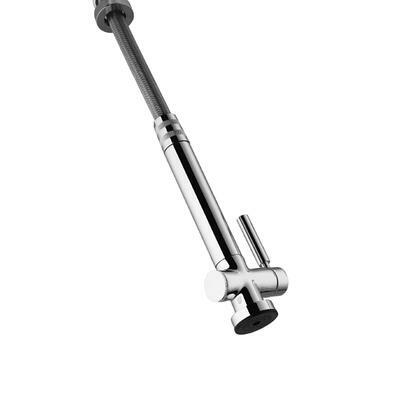 Faucet spout reach: 8 5/8"
What a Faucet - but WHAT AMAZING customer service! I will be installing my new faucet in a few days after countertops are installed. It will probably be the most impressive item in my kitchen! Being so professionally and substantially made will surely lead to many years of great use. Yes it is large and other reviews say that as a negative but it's really awesome great heavy quality no problems whatsoever. You won't be disappointed I thought I might as I am extremely picky but, wow it's really a cool faucet. I love the faucet and the look of the product. Have had problems with the sprayer and have had to replace twice. Can't say enough good things about customer service. Replaced the sprayer twice for me no problem. Shipped right away and easy to replace. Bought this faucet for my new house and it is very heavy, like it is quality construction. Very thorough package to avoid damage and it was delivered quickly. We bought this faucet after I reviewed and shopped for kitchen faucets for about a year. When it arrived we knew immediately we made the right choice. 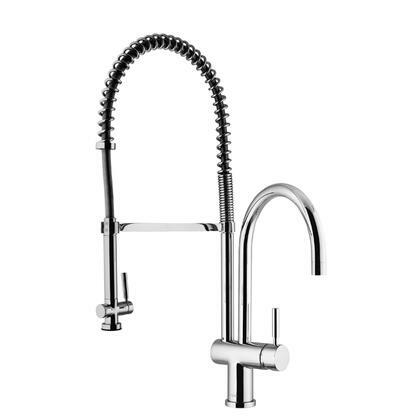 The faucet is made extremely well, looks great and will definitely update the kitchen for a rather small amount of money. Be aware it is more "industrial" looking, but not so much that it won't fit into our traditional kitchen with granite and stainless steel.